You can download the ENTIRE 7.7GB library, right now. Instant Download of the 8.6 GB COMPLETE LIBRARY (ZIP file). Early access whenever new samples are added to the library. We will send you emails with links to download every new sample pack as it is released. Download ten times faster. 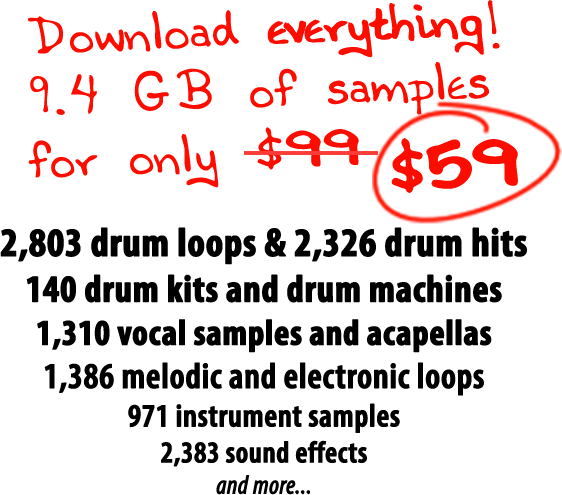 If you still want to use this website to download samples, fill each basket with up to 200MB instead of just 20MB. * If this doesn't turn out to be the best $29 you've ever spent on samples, just ask and I'll refund you $5 more than you paid ($34). Just feeling grateful for this website? You can make a contribution of any amount. Thanks for supporting the Internet's first and best library of free samples. Can I preview what's in the library? You can explore the entire library on this website. You can even download as many individual samples as you like, for free! But as a member, you can download the entire library as a single ZIP file, which is a helluva lot faster. Also, members get early access whenever fresh samples are added to the collection, which happens a couple of times a year. We don't recommend you click on this button. No really, it's a ridiculously long listing.